Today, while wandering the homestead in a t-shirt with a cup of coffee in hand, I discovered my rhubarb and ramps have sprouted up from the ground. The kids dug out a Frisbee from the garden shed and dashed around the soggy yard, obviously invigorated by the warm winds. Spring has arrived! It’s time to start planning the many ways we will take advantage of the glorious warm weather. If you’re anything like me, your mind turns to outdoor entertaining just as soon as the last hunk of ice melts into a puddle on the deck. 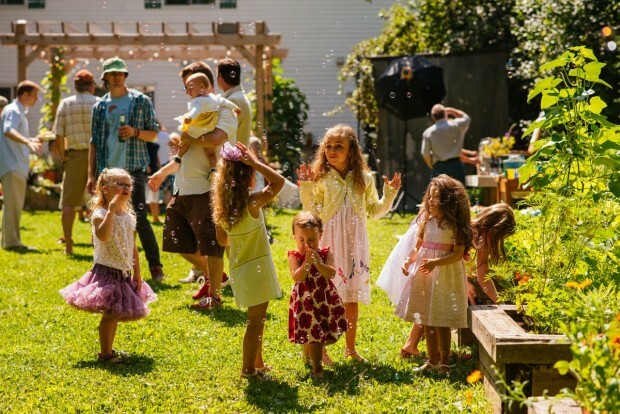 The upcoming months hold many opportunities for celebration from a Mother’s Day brunch to a wedding shower lunch, but today I want to talk about throwing a BIG backyard party. The sunup to sundown kind of event, where more people pass through your garden gate then you usually see in an entire month. The kind of party you only throw once in your life – unless you thrive on this sort of thing, of course. Maybe you’re contemplating celebrating your parent’s golden anniversary in your garden instead of the sweltering church basement, but you’re not sure where to start planning. Perhaps you’re thinking about a reception to commemorate a recent special graduate, but are worried that you are completely crazy to host everyone at your place (you’re not). Or the ultimate big backyard party? A wedding. Yep, I’m saying it can be done. Why? 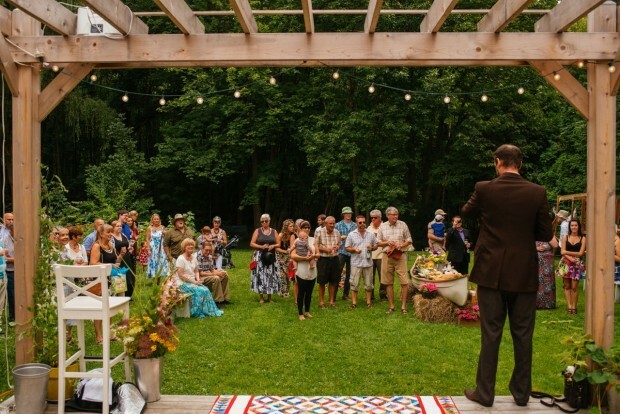 Because Danny and I hosted a wedding reception for 80 guests on a beautiful August afternoon in 2015. And we lived to tell the tale. It was one of my favourite days on our urban homestead ever. 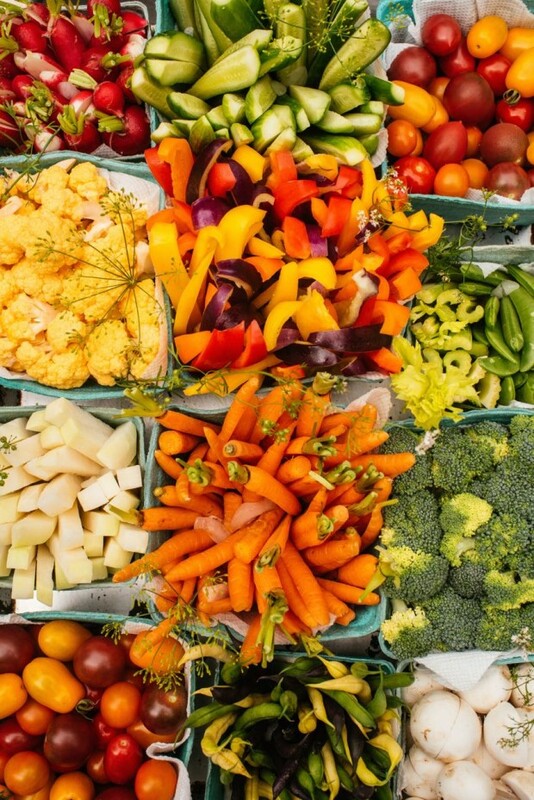 Maybe you just want to host your own harvest dinner? Pie party? Baby shower? Epic barbecue? Taco bar? Whatever sort of event that you wish to organize at home this summer, this post is jam packed with practical takeaways gathered from my years of hands-on hospitality. 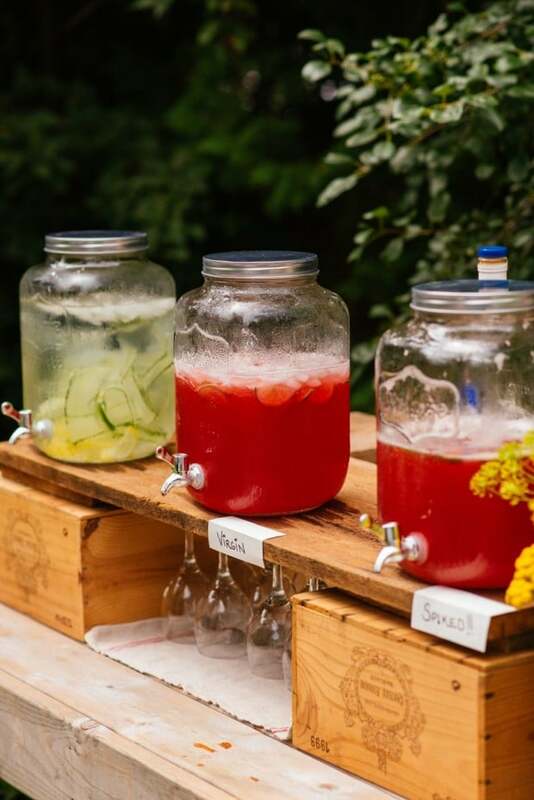 Read on, gather information, and then start planning your BIG backyard summer party. We could almost stop here before we’ve even gotten started, because as long as people have a delicious, refreshing drink in their hand on a sweltering day, they are happy. You’re going to need to read my full post on the subject >> How to set up a functional outdoor bar. I put a lot of thought into this essential party pit-stop and share my best advice from do-ahead tips to making the bar 100% self-serve. Unless you want to hire a couple of college students to be your bartenders (a feasible option, I’m not knocking this one bit), you want the bar situation to be autonomous. And since I highly recommend one punch to rule them all over a cocktail menu, here are 17 Big-Batch Cocktails To Whip Up At Your Next Outdoor Party. Have fun taste testing. Remember, you are hosting this party, not necessarily catering the party. Those are two very different approaches. And you will have your hands full just overseeing that everything goes smoothly from start to finish. This is no time to park next to a grill or find yourself stranded in the kitchen, cooking for a crowd. Your sanity-saving measure is having the bulk of the food delivered to your door and serving it buffet-style. And you will still save far more money then if you booked the banquet hall of a hotel or a local restaurant for your event. You can absolutely supplement that main dish – whether it be gourmet sandwiches or an entire lamb on a spit – with your own simple additions. I usually order really, really great sandwiches from my favourite butcher and make up my own platters of fresh fruit, summer vegetables & dip, cheese and pickles. Drinks, finger foods, sandwiches, desserts…they all need a place to be served to guests, not to mention other things like gifts and a guest book that need to be displayed. This takes rental tables…OR a bit of creativity using what you have on hand, which is always my preferred method. 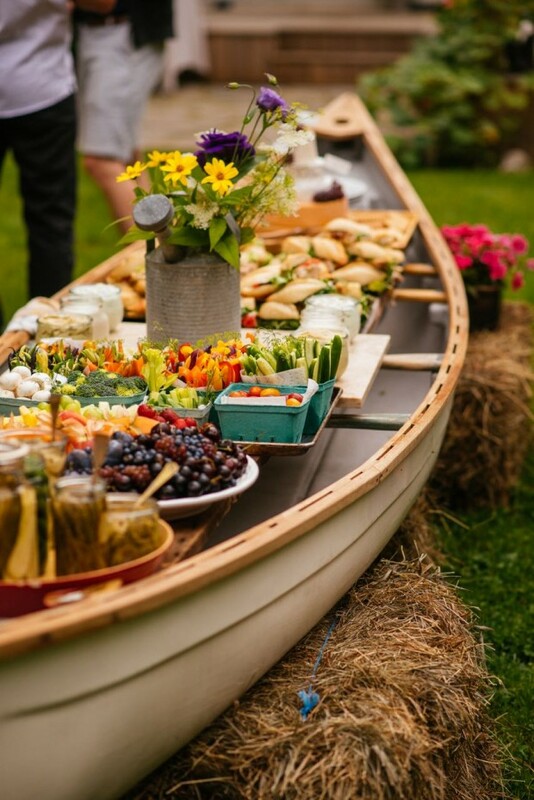 Of course I’m thinking of that time I presented a backyard buffet for eighty people served up between the gunwales of a canoe. The canoe ultimately served two functions: a buffet and an enormous conversation piece. It certainly fit in with the laid-back, garden party vibe we were going for that day. 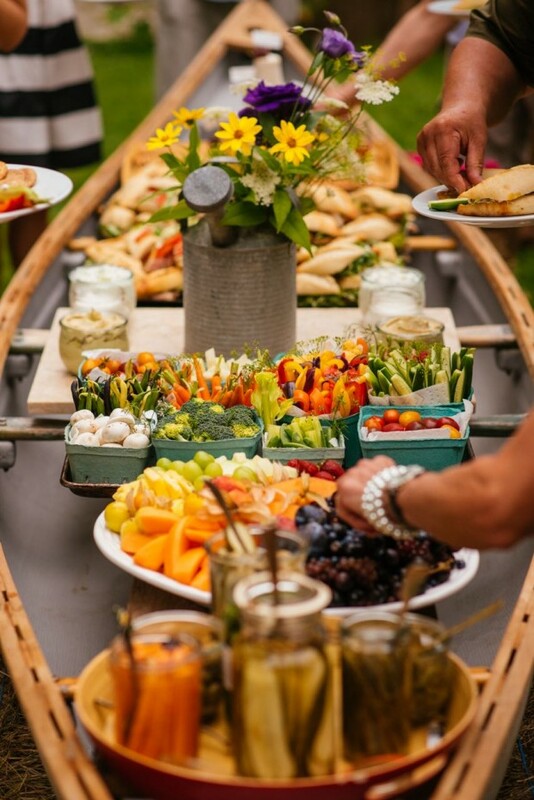 Get the tutorial (or just enjoy the photos) >> How to set up an outdoor buffet in a canoe. Chances are not many of you are going to have a canoe lying around, but you get my drift. Balance an old door on hay bales. Throw a tablecloth over a garage work bench. Haul a desk out of doors and disguise it as a table. Anything goes nowadays, even dessert served up in old dresser drawers. A big part of a successful party is accommodating all of your guests, right down to the little chubby-kneed toddlers. Here’s how it’s done >> Outdoor entertaining and keeping the kids happy. From what I’ve observed, eating comes second to playing games when our kids get together with their friends, so why not let them have their fun? Children can always eat a square meal tomorrow, but summer is fleeting, they should enjoy it while they can. My long-standing system for a sensational dessert table filled with summer pies, cakes and crumbles is always to delegate the sweets to those guests who love to bake. People love to help and nowadays, most any conscientious guest will ask if they can bring something. Have a few suggestions ready when you ask for a dessert, especially if you want to stick to a theme (cupcakes, pies, etc), or just wait and be surprised. Let your friends know that purchasing a pie or cake from a reputable bakery is just fine, but a box of cheap doughnuts is not. In the past I’ve suggested a theme of pies with great success. Read all about it >> How to host an old fashioned pie social. 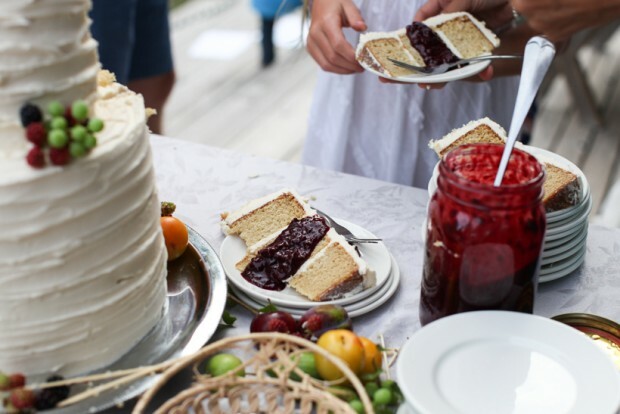 Of course you might just want to make a wedding cake and serve that up instead of delegating dessert. I’ve done that, too. Now this is a fun idea for pre, during or post-dinner. 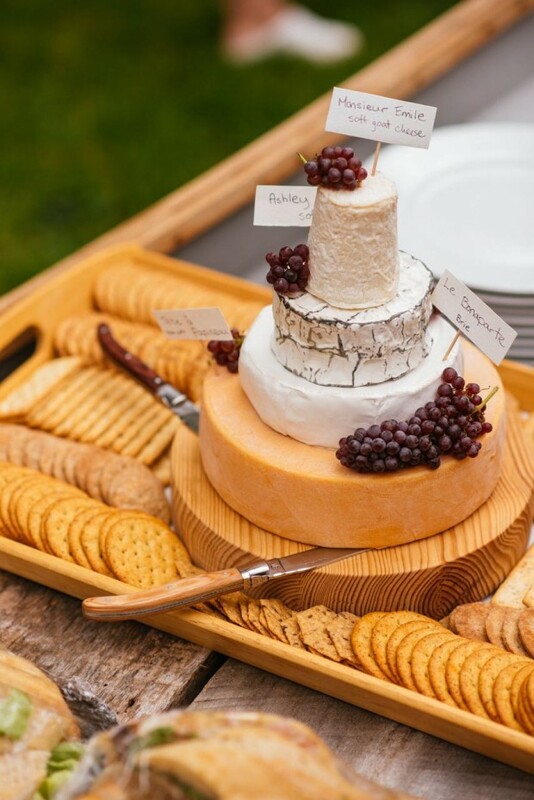 Cheese is good anytime and seems to be a crowd-pleaser at any event, formal or not. Get the tips and tutorial >> How to build a tiered cheese wheel ‘cake’. This unique presentation comes together quickly and serves a crowd – an ideal scenario for the sort of gathering we are talking about. Lastly, here are 8 ways to maximize refrigerator storage capacity when entertaining so you can ensure you have fridge space to hold the party food. Now you are all set. Are you hosting a big event this year? Share the details! We host a lot of summer gatherings, as we have a pool. I love the simplicity and rustic feel you present. A pool would take the backyard gathering to a whole new level, Nicole. I hope you’ve gleaned something here! Have a wonderful summer. 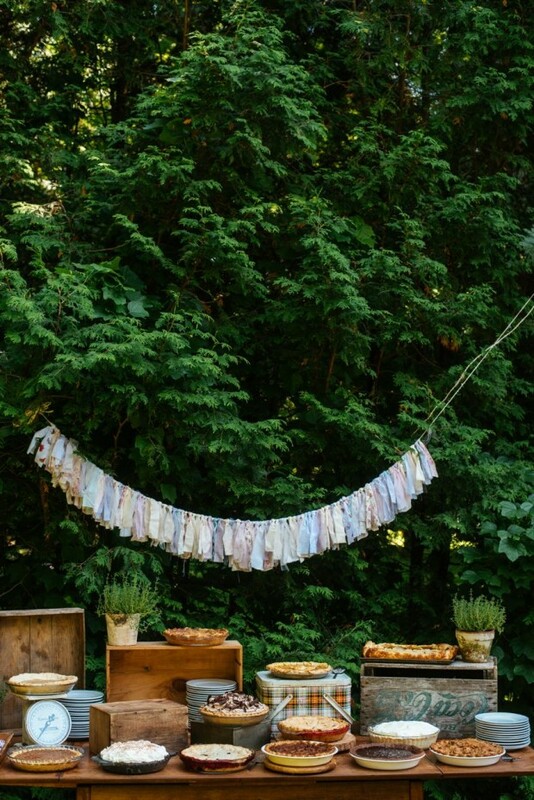 Amazing, the canoe gives it the rustic feeling of the party but very interesting. If I was there, I can’t get over going back to the canoe while picking up some food. You just gave me brilliant ideas for having a backyard gathering. I can’t wait to follow this article about it. Definitely, will bookmark. Hey Aimee, I love all these tips. But what about weather and rain?? I feel like that is more the stress than anything when planning a big backyard event. Did you have a rain date for the backyard wedding reception? We have 50 guests coming over on Saturday. It was supposed to be a backyard party. Forecast is heavy rain all day. The whole dynamic is now changed and the date can not be changed as we are celebrating a special event for my son that day (First communion). Anyway, just wondering how a planning mom can handle such a big questionable variable as weather when planning a backyard event. It stresses me out . . .
Patty, you are not alone, that’s for sure. The weather is the biggest stress when planning an event like this one. So I’m pretty nuts, but I planned the backyard wedding with absolutely no back-up plan for rain. It WAS in August, so that is a lot drier then May. This May in particular. I generally forge ahed with outdoor plans right up until the last second; sometimes it works and sometimes it doesn’t. Last year we had a big 40- person BBQ for Canada Day. We started with drinks and snacks on the patio while I grilled dinner. The air was heavy, and sure enough, by 6pm the wind whipped up and we had a thunder and lightning rainstorm.Everyone piled inside, but by that time the party was in full swing and no one cared. I’d say….wait until early Saturday morning to make your final decision, and if it must been indoors, then push back the furniture and make the most of it. Congratulations to your son. May the day shine on you!